The best way to remove and prevent blackheads -quicker. For those of us who struggle with blackheads, getting rid of them can be a real pain in the... pores. Despite their small size, blackheads can still be a bit unsightly (not to mention just annoying), and like to linger around for what seems like forever. While using the right topical skincare products (such as the MDacne products, which contain beta hydroxy acids to unclog pores) can help reduce the appearance and incidence of blackheads overtime, getting rid of them in a pinch is actually anything BUT. In fact, pinching, squeezing, and picking at blackheads can often cause more acne breakouts and even lead to long-term scars. So, what’s a pore (lol, see what we did there?) guy/girl to do? Alas, it turns out those good old-fashioned blackhead strips that used to get the odd cameo appearance in 90’s rom-com movies, were actually close to hitting the mark! Exhibit A: Epic scene from Princess Diaries (1) circa 2001...if you haven’t seen it, don’t walk—RUN! Pore cleansing strips—often used on and around the nose (see Exhibit A)—act like a magnet for the pore-clogging bacteria and other pore-clogging materials that can cause blackheads and other breakouts. But hold up before you run out to your local drug store and grab some generic strips off the shelf. Unfortunately, most of the blackhead/pore cleansing strips on the market are low quality, and often irritate the skin. Plus, while these strips can help treat existing blackheads, they, unfortunately, don’t do much to prevent future breakouts. But here’s the good news! We've put years of research and testing into crafting the best, most effective, yet non-irritating pore cleansing strips on the market. Used together with your customized MDacne skincare products, you can say “goodbye” to blackheads and blemishes and have fun while doing it (#oddlysatisfying). So, what makes the MDacne strips different? : In contrast to other pore-cleansing strips, which often irritate the skin, the MDacne blackhead strips were designed with sensitive skin in mind. They contain an oil-free moisturizer to reduce irritation, making them suitable for all skin types, including sensitive skin. Made of natural, plant-based fibers, these light and soft, dermatologist-tested strips remove oxidated sebum (i.e. blackheads) and other pore-clogging materials better than ever before. They absorb unwanted greasiness, mattifying excess shine without overdrying for clear, healthy, glowing skin. Plus, they're bigger than normal strips and can cover the whole nose as well as other areas of the face! Step 1 - Cleanse: Start by cleansing your face with your customized, MDacne anti-acne medicated cleanser (that sounds like a mouthful but it’s also a bottle full of goodness!). The cleanser will gently clean your skin, removing dirt, oil, and bacteria while softening the blackheads and preparing them for easy removal. Step 2 - Treat: Now for the fun part. Use *clean* hands to dampen your nose (or other target areas) and apply the strip to your nose, chin, forehead, or wherever else you’re experiencing blackheads. Wait 10-15 minutes until the strip hardens and gently remove. 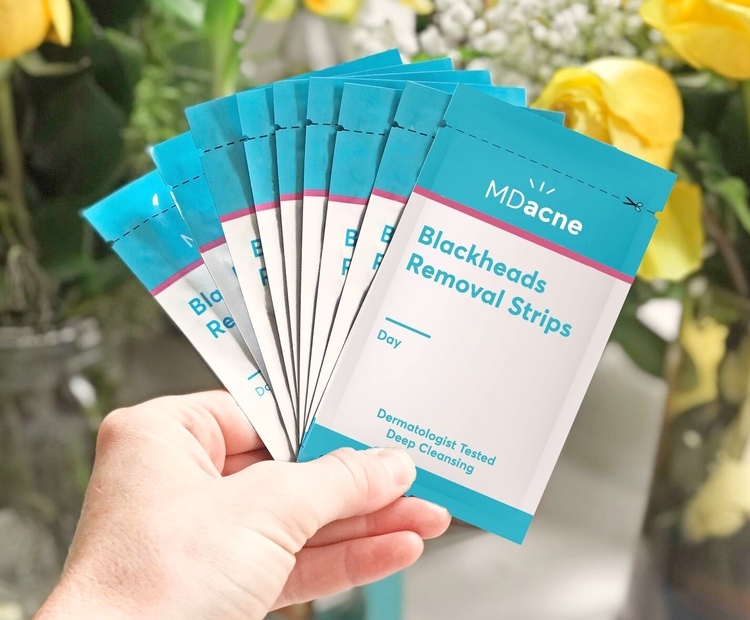 Purchase the MDacne Blackheads Removal Strips here!